When it's time for soccer practice, 7-year old Seth Baldwin runs to get his shoes and his shin guards. As he heads to the car, he uses one his few words to tell his mom "Soccer." While this is a common scene at households across the Triangle this time of year, Seth has developmental delays and very limited verbal skills because of partial Trisomy 19, a rare genetic condition, and would not be able to participate in a soccer league geared toward typical kids. But for the past several seasons, he has played in the Abilities Indoor Soccer League formed by Abilitations Children's Therapy & Wellness Center, a pediatric therapy center in North Raleigh. "Other kids go to soccer on the weekends and this program gives Seth an extracurricular activity just like everyone else," said Darla Baldwin, Seth's mom. When Seth first joined the league two years ago, he would sit on the sidelines and cry. But now he has a big smile on his face as he kicks the ball with his teammates. Baldwin, 37, said that since joining the program Seth's overall development has improved, especially following directions. On a recent Sunday afternoon, the indoor soccer field at the Factory in Wake Forest was filled with about 25 children in the Abilities league, wearing matching jerseys with their names on the back. At one end of the field, high functioning kids practiced kicking the ball into the goal and on the other end of the field volunteers helped children needing more assistance move their leg to kick the ball and play with a large blowup soccer ball. During the hourlong practice, the players learned basic soccer skills, practiced following directions and interacted with their teammates. When T.R. 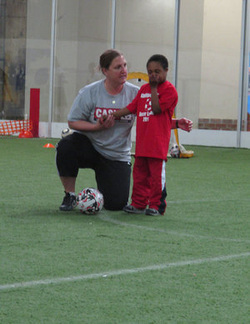 Goins and Jennifer Mock, co-owners of Abilitations and physical therapists, learned that parents were unable to find a soccer program for special needs kids, they decided to start their own in 2009. The league has two seasons a year and is open to children ages 5 to 12 with any level of disability, including autism, physical challenges and Down syndrome. "There is no limitation on any physical disability or development level. If a child wants to come, we will make necessary accommodations," Mock said. The level surface of the indoor field makes it accessible for children in wheelchairs or walkers and a soccer ball with a bell inside allows visually impaired players to locate the ball. "The program is therapeutic in nature, but we want them to have fun," Mock said. "The progress we see over the seasons makes us want to keep going to see what they can do next year." Each child has a volunteer to help them on the field, many of whom are coaches and players with the Capital Area Soccer League. Kelly Curran, a junior at Wake Forest-Rolesville High School, said one of the girls she works with continually asks her mom when she will get to play soccer with Kelly. "Hearing how much soccer meant to her made me excited to come play with her each week," Curran said. At the end of each season, each player gets a trophy donated by Wake Forest Awards and Engraving at a small ceremony after the last game. Allison Creekmore said her son 10-year-old son James was very proud of the trophy he got last year and carried it with him everywhere for days, even keeping it by his bed while he slept. James is in a regular classroom at school and it meant so much to get a trophy just like his friends, Creekmore said. "When the kids are on the field giving each other high fives, they feel included and it gives them confidence," Goins said. "Being a therapist, you want to see the kids make gains and have fun doing it. We really love doing this for the kids."